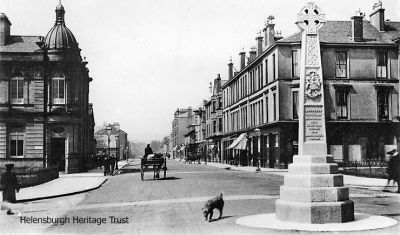 Looking west from Colquhoun Square along West Princes Street before the Centenary Monument was moved from the centre of the square to the north west quadrant. Provost Sam Bryden, who owned Macneur & Bryden's newsagent and gift shop in East Princes Street, Helensburgh, was the man responsible for the erection of the monument. Image circa 1908.